During the month of May, Costco warehouses in the United States and Canada are raising funds to help kids treated at Children’s Miracle Network Hospitals across the country. Costco also collaborated with General Mills for the May campaign. General Mills will donate $100,000 to CMN Hospitals (no purchase necessary), and is encouraging Costco members to donate at their local Costco in May. Shoppers will find specially marked CMN Hospitals boxes of General Mills cereal highlighting CMN Hospitals’ patients who have benefited from local donations to member hospitals. The day before Thanksgiving in 2013, 11-year-old Julie was diagnosed with an enlarged heart. She was admitted to the pediatric intensive care unit with her heart functioning at only 10 percent. Julie’s doctors determined the need for a heart transplant and prepared Kapi’olani’s specialized transport team to safely transport Julie to a mainland center. The transplant was a success, leaving Julie a healthy, composed teen who enjoys spending time with her family and friends, as well as reading, drawing, watching TV and playing video games. She is not ashamed of her condition and shares it openly with everyone. She is proud of her scar, as it’s a reminder of all she has been through. How donations helped Julie: Kapi’olani’s pediatric transport team ensured that Julie was safely transferred for her transplant surgery. The transport team, funded in part by CMN Hospitals, is critical for ensuring that Hawaii’s children receive the medical care they need. 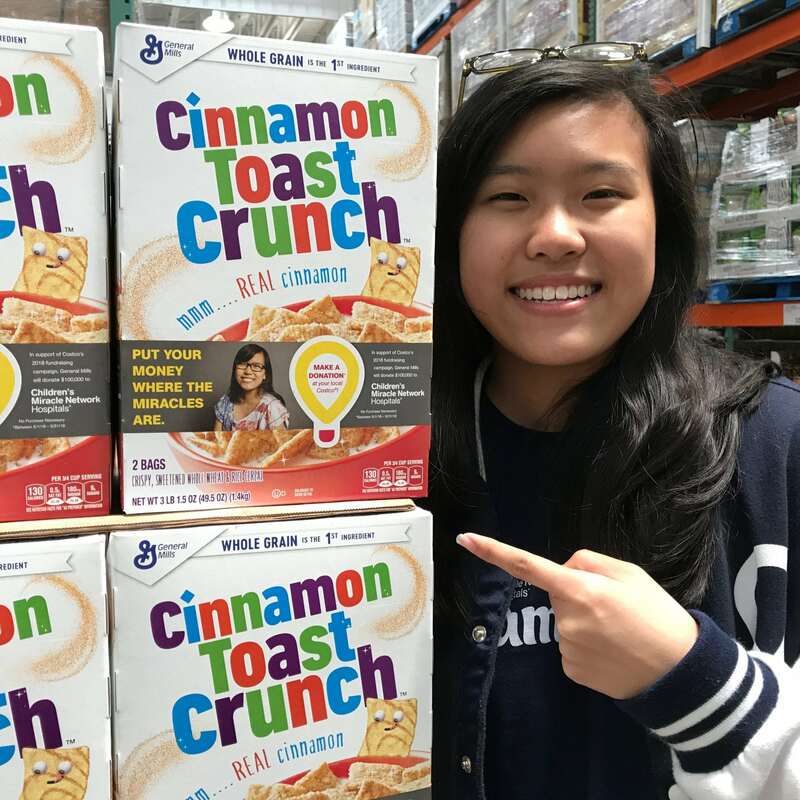 Julie is pictured on the Cinnamon Toast Crunch cereal boxes at all Costco stores during the month of May. At 3 months old, Elise was diagnosed with Jacobsen syndrome and a rare congenital blood disorder. The combination of conditions has lead to numerous medical issues. Elise has to be cautious and will need long-term medical care, but that doesn’t stop her from saying, “I want to be everything when I grow up!” When she wants to do something, she practices and perseveres even when it’s tough. How donations helped Elise: CMN Hospitals funds purchased the Distraction Station that helps Elise deal with shots and blood draws. They also covered an EKG machine, a garden complete with red wagons, and the pet therapy program that helps children like Elise cope with stress. 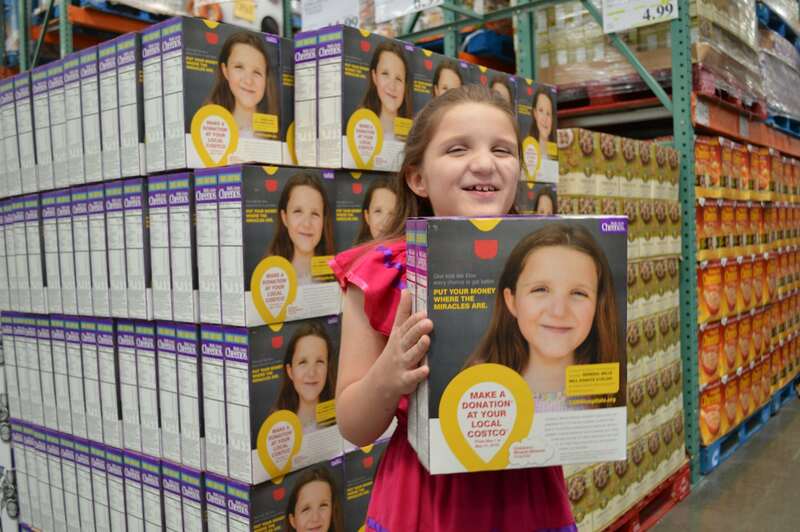 Elise is pictured on the Multi Grain Cheerios box at all Costco stores during the month of May. How donations help Jordan: The facility where Jordan receives physical therapy for his unique type of cerebral palsy is able to keep its doors open thanks to donations made through CMN Hospitals and other initiatives. Jordan is featured on the Lucky Charms cereal box at all Costco stores during the month of May. With a long history of serious health conditions in the family, Daniel and his brothers had routine labs and checkups each year. In 2011, their fears were realized when Daniel was diagnosed with advanced Crohn’s disease after spending 48 consecutive days in the hospital. While Daniel was fighting to get stabilized, his hospital fought just as hard to provide the best care available. He spent the next six months in and out of the hospital for treatments. Not your average 16-year-old, Daniel is now healthy and his disease is fully under control. He loves to play video games and is an avid Extra Lifer, participating in the CMN Hospitals fundraising program. He enjoys competitive shooting and has earned various first-place medals in local events. He also plays the French horn in a musical symphony group. How donations helped Daniel: CMN Hospitals donations help kids like Daniel by providing various medical needs, including paying for his medical expenses. Daniel is featured on the Cheerios box at all Costco stores during the month of May. Medical prognoses don’t carry much weight with Katie and her family. Katie has defied them all. She was born with a cleft palate and an extremely rare genetic disorder that affects the pituitary gland, important for heart rate, thyroid, blood pressure, growth hormones and more. Katie is only the fourth person to be diagnosed with this disorder. Katie’s diagnoses also include a deviated septum and small optic nerves. She’s had many medical obstacles and wasn’t expected to ever see, but she has overcome them all. How donations helped Katie: CMN Hospitals donations have supported Katie from her first days in an intensive care isolette to the pediatric nebulizers she uses today for her breathing treatments. 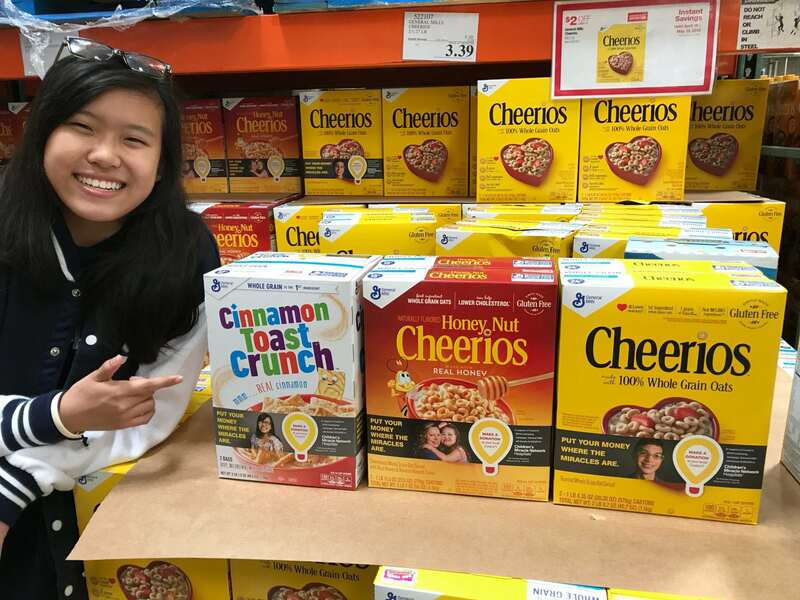 Katie and her mom are featured on the Honey Nut Cheerios box at all Costco stores during the month of May.